In this quickstart, you'll learn how to sign up for Azure Cognitive Services and create a single-service or multi-service subscription. 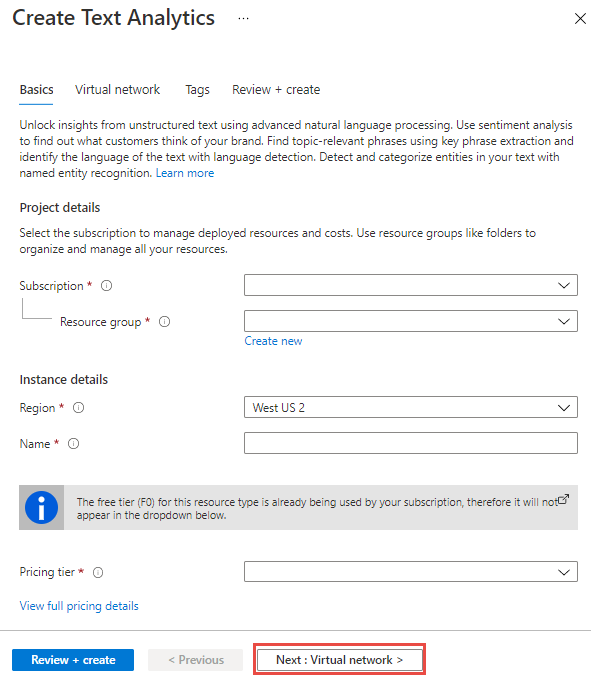 These services are represented by Azure resources, which enable you to connect to one or many of the Azure Cognitive Services APIs. A valid Azure subscription. Create an account for free. Before you get started, it's important to know that there are two types of Azure Cognitive Services subscriptions. The first is a subscription to a single service, such as Computer Vision or the Speech Services. A single-service subscription is restricted to that resource. The second is a multi-service subscription for Azure Cognitive Services. This subscription allows you to use a single subscription for most of the Azure Cognitive Services. This option also consolidates billing. See Cognitive Services pricing for additional information. At this time, these services don't support multi-service keys: QnA Maker, Speech Services, Custom Vision, and Anomaly Detector. The next sections walk you through creating either a single or multi-service subscription. 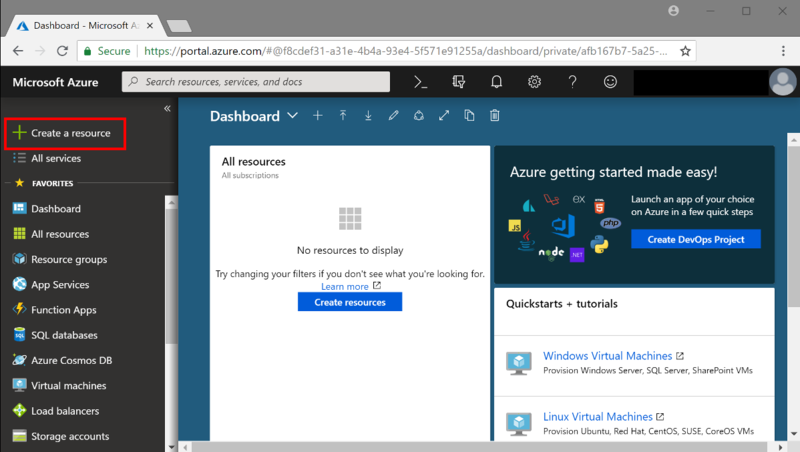 Sign in to the Azure portal, and click +Create a resource. Locate the search bar and enter: Cognitive Services. Name A descriptive name for your cognitive services resource. We recommend using a descriptive name, for example MyCognitiveServicesAccount. Subscription Select one of your available Azure subscriptions. Location The location of your cognitive service instance. Different locations may introduce latency, but have no impact on the runtime availability of your resource. Pricing tier The cost of your Cognitive Services account depends on the options you choose and your usage. For more information, see the API pricing details. Resource group The Azure resource group that will contain your Cognitive Services resource. You can create a new group or add it to a pre-existing group. 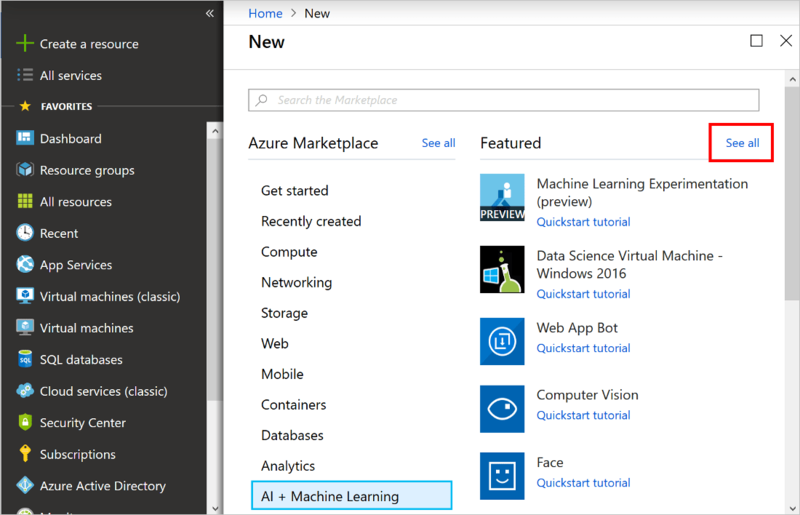 Under Azure Marketplace, select AI + Machine Learning. If you don't see the service you're interested in, click on See all to view the entire catalog of Cognitive Services APIs. Name A descriptive name for your cognitive services resource. We recommend using a descriptive name, for example MyNameFaceAPIAccount. 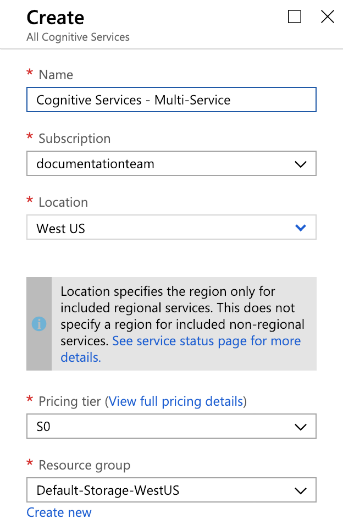 Subscription owners can disable the creation of Cognitive Services accounts for resource groups and subscriptions by applying Azure policy, assigning a “Not allowed resource types” policy definition, and specifying Microsoft.CognitiveServices/accounts as the target resource type. After creating your resource, you can access it from the Azure dashboard if you pinned it. Otherwise, you can find it in Resource Groups. Within your Cognitive Services resource, You can use the Endpoint URL and keys in the Overview section to start making API calls in your applications.